From Tuesday, banks will start charging customers Rs 18-20 every time they withdraw money from another bank's ATM, and such withdrawals will also face a limit of Rs 10,000. Customers will be offered five free third-party withdrawals per month from savings accounts and will be charged from the sixth transaction onwards. However, all banks are not offering the same facility of five free withdrawals per month to current account and no-frills account customers. For instance, HSBC and HDFC Bank will charge current account customers for all third-party withdrawals. Customers have been enjoying the flexibility of withdrawing cash from any banks' ATM free-of-charge since April 1, 2009 since a Reserve Bank of India directive to that effect came into force. However, banks complained that the number of transactions had increased dramatically since April 1, 2009 while the ticket size of each withdrawal had reduced, resulting in increased interchange expenses for banks. Every time a customer uses another bank's ATM, the customer's bank has to pay the acquiring bank an interchange fee of Rs 18-20. From October 15, customers will have to bear the interchange fee after they exhaust their quota of five free savings account transactions per month. However, Axis Bank, which has the third largest ATM network in the country, has chosen to break ranks and not charge its customers for third-party withdrawals. Sources said this is part of the bank's strategy to attract current account and savings account customers. The bank was seeing positive interchange flows even when the free ATM rule was in place and is thus is in a position to offer this facility to its customers. Banks are required to inform customers about the charges one month in advance and claim they have been doing so through quarterly statements and advertisements at ATMs and branches. Instead of charging all customers uniformly for third-party ATM use, some banks are framing their charges depending on the profile of the customer. For instance, HDFC Bank is allowing its salary account and premium customers an unlimited number of free third-party ATM withdrawals while offering five free withdrawals to savings account customers. 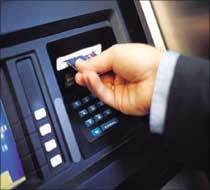 HSBC is also waiving ATM charges for its Premier and PowerVantage customers. "This is likely to be the trend in the industry and I expect most banks to follow suit. Remunerative accounts will not be charged whereas no-frills and zero-balance accounts will be," said a senior executive of a private sector bank. What if our ATM network is hacked?